I was going through my pictures and old posts and realized I never showed these pinwheels. If you remember from here I made strawberry and blueberry flavored jello cookies using the newest sweet pressed cookie stamps to take to a 4th of July party. I wanted to design cute labels so people knew what flavors they were. In the June issue of Stampin' Success (which is a demonstrator only magazine, a GREAT perk for being a demonstrator) featured pinwheels so I took my inspiration from there. 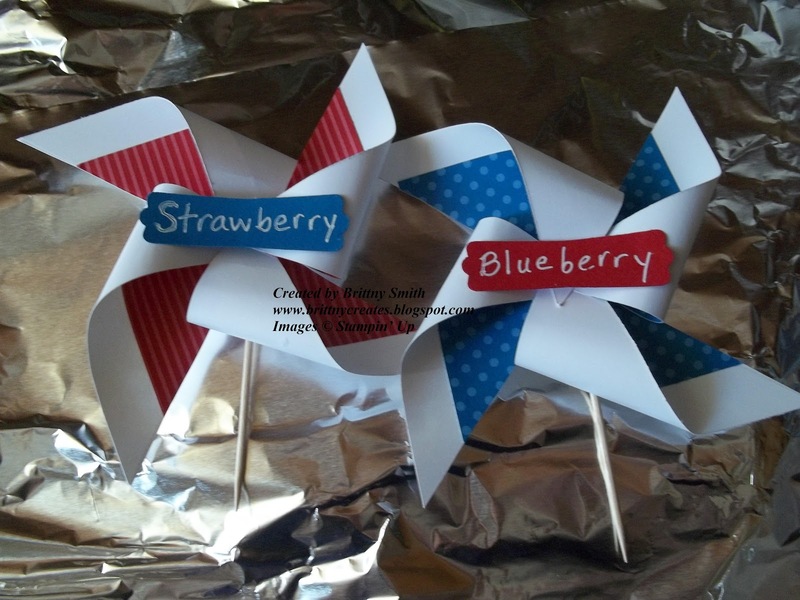 The largest pinwheel was made with whisper white and the inside pinwheel used real red and pacific point. They are perfect colors for 4th of July and red, white and blue colors. To make these pinwheels, you first have to decide how big you want them to be. Once you know your size, you cut that size square. For example, I made my largest pinwheel 4 x 4. Than using the Simply Scoring Tool you draw diagonal lines to each corner. Now you'll use your scissors to cut into the center from each corner leaving about an inch from the center. Next, using the paper piercing tool and mat, make a hole in the middle of your two diagonal lines and on the right side of your cut lines. Each triangle should have 1 hole. To assemble, use a brad and curl in the corners with the hole into the middle and attach all with brads. You'll need to create something to cover your brad like I did with my labels. To acheive my double pinwheel affect: Cut a smaller size square from DSP. I made mine 3 x 3. Glue onto whisper white before creating your pinwheel with the steps above and that's it!! How cute are these and can be used for any occasion or reason!